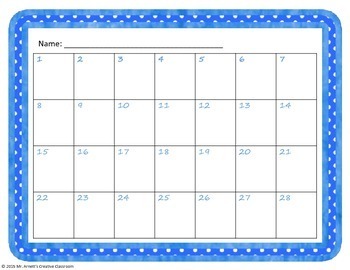 Engage your students in multiplication practice with this set of 28 task cards. 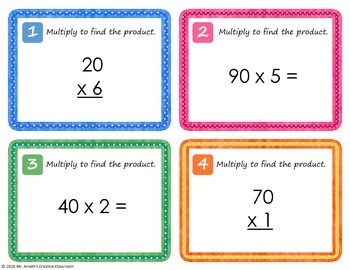 Students can use multiple strategies to solve two digit multiples of 10 times a single digit. 1. Whole group instruction: Simply put the cards up on your SMART Board or projector and have your students answer while they are sitting at their seats, either calling the answers out loud or writing them down on the included recording sheet. 2. Small group instruction: Print out a set and use them to improve your students skill in this area in a small group setting. This use will give you a chance to instruct this skill further. 3. SCOOT: Print out a set and place them on desks around the room. Place a student at each card and when you give the signal, they will answer the card at their seat. When they are finished, simply yell "SCOOT" and the students move to the next station and answer the next card. Continue until every student has visited every station. This is a tremendous way to get your kids out of their seats! 4. Individual practice/Formative assessment: Print out a set of cards and an answer sheet and have a student work through and record the answer on their provided recording sheet, then you can go over or they can turn it in. 5. Homework: Print the cards out on full sheets of printer paper as well as a recording sheet. Have your students take home the problems and answer each question. They bring the answer sheet back to class for your to go over, or take for a homework grade. 6. 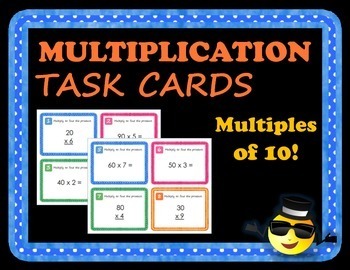 Matching game: With this set of multiplication task cards I have included a set of answer cards. 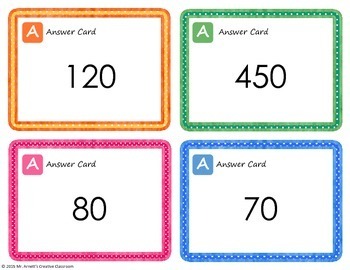 Use these answer cards to engage your students in a fun matching game. Simply hand out question cards to half of your class, to the other half pass out the corresponding answer cards. On your signal the students' objective is to find the person with the card that matches theirs. In order to do that, each student will have to solve the question on their card, or determine the problems that could match their answer. Tremendous practice for higher level thinking skills! This game can be played again and again, just mix them up and pass out the cards again. Your students will LOVE playing this game! You will be so thankful that you made this purchase! 36 pages includes 28 task cards, student recording sheets, and answer keys, plus a matching set in black and white when you can't print in color. Need more problems? Also included is sheet of blank problem cards and sheet of blank answer cards to make your own! Visit my store for more fun and engaging activities for your creative classroom!